‘Tis the season for lists and reminiscing, so greenmomster is going to indulge! Here’s the list of my 10 favorite green activities for 2012. I’d love to hear about yours too – be sure to post them on Facebook! 10) Starting out the New Year at our favorite park – Sky Meadows – with our annual New Years Day hike! 9) Being chosen as a Climate Mama on the Climate Mama website, a website and organization dedicated to reducing human impacts on our climate! 8) Clamming on Block Island RI! What a great day – hanging out with our favorite environmental science teacher, raking up clams, and learning about sustainability. 7) Adopting a stream! OK, maybe our stream wasn’t quite as healthy as we thought, but it was a great experience and we learned a lot. And hope springs eternal – we’re checking out our new stream in January 2013! 6) Goin’ Ape! Swinging from ropes, practicing our tarzan yells, and zip-lining! 5) Volunteering at Sky Meadows State Park with the family! Whether we’re hiking the trails for trail maintenance, designing a calendar, taking pictures at park events, or collecting acorns, any day at Sky Meadows is a great day! 4) Camping at Bear Creek Lake State Park! Canoeing, fishing, archery, s’mores, and glamping in my new BIG tent with the family – what could be better than that? 3) Hiking and biking on Bull Island SC! We’ve still got that SC beach buzz going as we enjoy our sand dollar Christmas tree ornaments. 2) Attending the anti-fracking rally on the U.S. Capitol grounds this summer! Craft supplies for our protest signs – $3; parking near the rally – $20; sunscreen for the incredibly hot day – $10; hearing my son say “Hey Mom, I never knew there were so many people like you out there!” – priceless. 1) Definitely one of my favorite green activities every year – watching the baby loggerhead sea turtles dash from their nests to the ocean! Happy New Year to all of the greenmomsters out there! Here’s to a green 2013! It’s an oldie, but a goodie – veggie chili! I adapted this recipe from a Cooking Light chili. Don’t be afraid to fiddle with the spices to make it taste the way you like it. I made a batch for 70 people this week at our church and everyone loved it! Check out the accompanying cornbread recipe. Garam masala: I don’t measure out these exact amounts – I just use proportions. So you should have 3 times as much cumin as pepper, etc. 2) Add garam masala, cinnamon, red pepper, nutmeg, and tomato paste. Saute until things are well mixed together. 3) Add water, vinegar, and tomatoes. Cook 5 minutes. 4) Add beans and corn and cook for about 20 minutes. Endangered species who love the cold! To ring in the arrival of winter, this week we have an arctic two-for-the-price-of-one deal. On Friday, two species of seals were added to the U.S. endangered species list, joining the polar bears on the list of species threatened by the loss of sea ice due to climate change. The ringed seals (Phoca hispida) (photo from Paul Nicklen at http://animals.nationalgeographic.com/animals/mammals/ringed-seal/) and bearded seals (Erignathus barbatus), protected under the Marine Mammal Protection Act, were this month listed by NOAA as threatened under the U.S. Endangered Species Act. I was out at our favorite Sky Meadows State Park yesterday, enjoying the beautiful decorations. The Mt. Bleak house was adorned in decorations from the Civil War to the 1950s. Park personnel were cooking in the fireplaces – apple tansy, jambalaya, cornbread, and wassail! Just the right place to get in the mood for Christmas Eve and Christmas Day. I wish you and your family a happy, healthy, and green Christmas! 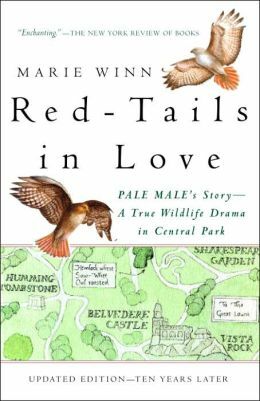 I just finished reading a great book – Red-Tails in Love, by Marie Winn. If you’re looking for a high-action, violent New York City story, this ain’t the book for you. On the other hand, if you’re looking for a little romance (not quite as long-lived as When Harry Met Sally), this could be your book! The story follows the adventures of a male hawk and his mates as they search for nesting sites and raise chicks in New York City. Ms. Winn, one of a group of dedicated bird watchers in Central Park, skillfully tells the story, from first discovery of the male hawk, through nest construction all the way to the successful rearing of young hawks. The author also provides fascinating details about other birds in Central Park, both the neo-tropical migrants and the everyday birds like crows and starlings. But this isn’t a book just for birders; her writing is clear and descriptive, even for non-birders. She includes stories about gray gulls from Peru, Mary Tyler Moore’s apartment building, and unexpected owl sightings. I love New York City, all of it’s energy and excitement, and this book provides another angle on a great city. This week’s meat-free Friday dish comes to us from Texas! I adapted this recipe from one I found in Necessities and Temptations by the Junior League of Austin. As an aside, you can get this cookbook for just 64 cents at the Barnes and Noble website, and I use many of the recipes (like the yummy banana bread recipe) frequently. So enjoy a little southern zest this Christmas week with some Tex-Mex quiche! 2) Combine mushrooms, bell peppers, and onions. 3) In a separate bowl, beat eggs and add mayonnaise, flour, milk, salsa, and Hatch chilis. 4) Stir vegetables into the egg mixture. 5) Layer 1/2 of the veggie/egg mixture into the pie shell. Sprinkle a layer of cheese on top and then add the rest of the veggie/egg mixture. Sprinkle remaining cheese on top. 6) Bake 40 to 50 minutes, or until firm and a knife stuck in the center comes out without liquid on it. In elementary school, we all learned that recycling is a great way to reduce our impact on the environment, but maybe you need a little “refresher” regarding WHY recycling works. Well, here it is! A new graphic from Education Database Online blog provides a quick, easy reminder about the positive results of recycling! Big News for a Little Keystone Species! The Chesapeake Bay’s menhaden (Brevoortia tyrannus) (photo from NOAA, 2012) scored a big victory last week, when the Atlantic States Marine Fisheries Commission (ASMFC) voted to reduce the catch of Atlantic menhaden by 20% per year. The goal is to reduce overfishing of this important species and leave more individuals to mature to year three, when they’ll be ready to reproduce. Menhaden are a small, oily fish historically used for bait. Recently, though, menhaden fishing has become a big industry, supplying fish for the booming Omega 3 fatty acid market. Menhaden are currently fished using spotter planes and huge purse seine nets (the recreational bait fishery also uses cast nets); populations are now only about 8% of their all-time population highs. Menhaden are important, because they’re what scientists call a “keystone species.” A keystone species is a species that has a disproportionate impact on its ecosystem, relative to its biomass; like a keystone in an archway, if the keystone species is removed, the arch, or ecosystem, will collapse. Keystone species include the sea otter population in the Pacific, desert tortoises in the western U.S., and even prairie dogs (many species depend on their burrows for shelter and hunting). Removal of menhaden will impact species up and down the food chain and will remove a critical link in the ecosystem. Menhaden sit at the center of the Chesapeake Bay food web. They are a filter feeder, feeding on zooplanton and phytoplankton, and they’re a vital food source for rockfish, weakfish, bluefish, and predatory birds such as osprey. Without healthy populations of menhaden, ecosystems will suffer, as will the fisheries that depend on these healthy ecosystems. So score one for the menhaden! Now it’s time for the Virginia General Assembly to approve the new catch limits. VA legislatures need to hear from greenmomsters and dads who would like to protect this valuable resource and ensure a healthy Chesapeake Bay for future generations! Don’t know who your representative is? Check out the VA General Assembly website. This week we have three new sources of information on the topic. Both are worth watching if you’re interested in the topics of illegal wildlife trade and biodiversity conservation. 60 Minutes this week presented a fascinating piece on reptile conservation. Arkive also provided a great overview of the illegal trade issue on their blog today. Additionally, The World Wildlife Fund recently posted all presentations from a symposium on illegal wildlife trade – definitely worth a view to learn more about this important issue. If you’re interested in helping to stop the international illegal trade in wildlife, check out how you can participate through World Wildlife Fund. American eels are hatched from floating eggs in the Sargasso Sea in the Atlantic Ocean. The small, transparent larvae that are shaped like willow leaves float toward the Atlantic coast for about 1 year (photo from Northeast Eel and Elver Company, http://www.fcps.edu/islandcreekes/ecology/american_eel.htm). By the time they reach the coast, the young fish have developed fins and look like adult eels, except that they’re still transparent. This stage is called “glass eels”. During the second phase of life, the fish are gray to grayish brown and are called “elvers”. Juveniles mature to the “yellow” phase, during which the sexually immature fish are yellow-green to olive brown in color. Eels can take 3 to 40 years to mature (it’s a faster process in estuarine and marine waters), before they head back out to sea to breed. Silver eels, the sexually mature migrants, change from bottom dwelling fish to open ocean swimmers. They build up fat reserves for the long migration, because they don’t eat on their way to the Sargasso Sea. Their eyes double in size in order to be able to sea in the ocean! Once in the Sargasso Sea, the females lay 20 to 30 million eggs to be fertilized by the males! While the eels are living upstream, they hide under rocks and feed at night eating insects, fish, fish eggs, crabs, worms, clams and frogs, as well as dead animal matter. And there are even more fascinating facts about eels. The USFWS (2009) reports, “with their relatively weak jaws and many small teeth, eels have developed an unusual feeding process with food that cannot be consumed whole or readily broken into pieces by jerking or pulling. Holding on with their mouths, adult eels spin their bodies to break apart food, and have been recorded at six to fourteen spins per second. In comparison, Olympic ice skaters can spin five times per second.” Additionally, eels can breath through their skin as well as their gills, making short transits on land possible! So what’s threatening the eel population? Overfishing. In some European countries (where eels are eaten regularly), populations are down by 99% of their historical size. Dams and other blockages. Eels have trouble getting to their upstream habitat because of man-made structures. They are also often killed in the turbines of hydropower plants. Parasites. An Asian parasite (introduced via aquaculture) that affects the eel swim bladder has infected the population. Want to learn more? Be sure to check out this in-depth and informative report from the Gulf of Maine Council on the Marine Environment. This week’s endangered species is staghorn coral (Acropora cervicornis)(photo from NOAA's Florida Keys National Marine Sanctuary). This fast-growing coral can reach lengths of 6.5 feet and can reproduce both asexually (by breaking off pieces of itself) or sexually (through broadcast spawning). Corals are animals and thus eat other animals caught in their tentacles, but they also have a symbiotic relationship with algae, taking advantage of the products of algae’s photosynthesis – very clever lifestyle indeed! The staghorn are tropical corals found in the Atlantic ocean, Caribbean Sea, and Gulf of Mexico. The biggest threat to this species of coral is disease, but hurricanes, predation, bleaching, temperature and salinity variation, and low genetic diversity (that’s what happens when you reproduce asexually) are also threats. I’m dreaming of a green Christmas…. Artificial trees – Here’s a fun fact from Earth911, “a U.S.-based toilet bowl brush manufacturer, the Addis Brush Company, created an artificial tree from brush bristles in the 1930s, acting as the prototype for modern artificial trees.” I’ll remember that tidbit, as I relax next to my beautiful fake tree that I enjoy year after year. Here’s the big con to artificial trees – most are made of non-recyclable, non-biodegradable metal and PVC. Thus, when you throw them away, they’ll sit in the landfill for many generations to come. Since my family keeps their artificial trees for decades (my mother has had her artificial tree for nearly 50 years), I’m not losing sleep over this con. A more troublesome issue with artificial trees -- most are produced overseas and must be shipped to the U.S. – think fossil fuels and pollution in production and shipping (Earth911 2012). If you’ve decided on a fake tree, GoodHousekeeping has some recommendations regarding brands to try. Try one of the eco-friendly card companies, using soy inks and recycled paper. 4) The gifts! There are actually fun green gifts that don’t lead to forced smiles and insincere thank yous!